The first episode of Mama June: From Not to Hot has been released online by WEtv ahead of tonight’s premiere, and, while the preview shows off Mama June Shannon‘s jaw-dropping physical transformation, the scenes involving June’s daughter Alana “Honey Boo Boo” Thompson, proved to be the most shocking. In one disturbing scene, eleven-year-old Alana, who has struggled with her own weight for years, is seen packing her lunch for school. First, she dumps a box of Hostess cupcakes into her lunchbox, followed by a full bag of cheese balls, a container of ice cream and Nutella, and a few cans of various slop. “I love food!” she proclaims before her mother tells her to go change out of a tank top that is obviously too small for her. June eventually makes Alana’s lunch much healthier…by taking out the ice cream. In another scene, Alana refuses to do a workout tape with her mother. When the preview was posted to WEtv’s Facebook page, some fans were outraged that June allowed Alana to eat so poorly. Back in 2015, June and Alana appeared on The Doctors to discuss Alana’s weight. Mama June later slammed the show and its producers for trying to make her and her daughter look bad. ‘Mama June: From Hot to Not’ airs tonight on WEtv. Anna: For the love of god, separate yourself from these people as much as you possibly can. Don’t ever sink to their level of trashy. The way everyone eats on that show literally makes me sick. Gluttony. Honey boo boo is so adorable but her gross excessive weight is sad. Why doesn’t mama have her walk with her. Great healthy bonding. Who cares about these dirty hillbillies? She’s as dumb as a box of rocks and that kid is headed for health issues. Did June wear a fat suit? I was thinking through the whole show,there’s something not right with her face, then I hear on social media she was wearing a fat suit! And you can totally see she did not weight 350 ,like the scale said. More like 250. Who does WeTv think they’re fooling ..not me! ? Anna was raised by June’s mom, so probably the reason.. This is one where I hope it was staged. Maybe it’s a storyline they are creating. Honey B loosing her weight or not could be a good cliff hanger to get another season of money. I didn’t think I could despise Mama June any more than I did, but… WOOSH there goes that lowering bar. You’re making healthy choices for yourself in order to get a new molester boyfriend, but you can’t be arsed to cook your morbidly obese child healthy meals and find a fun exercise to do as a family? Morbidly obese and not even 13. Ridiculous. This should be considered child abuse and charges should pressed against the parents. Nasty slobs that they both are, being concerned with their lives and well-being, but not this kids life and future. Shameful trash. Considering that the mother dated a child molester who abused her own child this is probably not even in the top 3 worst child abuse going on in that house. I agree 100%. Regardless if that specific scene was staged or not, it’s quite obvious that NO ONE is controlling or teaching that child anything about health. How can that fat slob complain about how it’s hard to move with all that fat and then (encourage?) allow her own child to become obese as well?? I feel bad watching Alana, she is painful to look at, she looks so uncomfortable. And June, if you want to lose weight, stop eating crap and start moving around. Surgery isnt some miracle freakin fix that is going to turn you into a woman overnight. Get some self control, forget about dating, and read a healthy cookbook. Poor girl. Some people shouldn’t be allowed to have kids. Being that Alana is 11 the obvious solution is don’t buy the garbage. She can’t eat it if it isn’t there. Was just going to say that. If you’re trying to lose weight and you’re the one grocery shopping, why are you buying hostess and cheese puffs and ice cream? It’s disgusting to see a child this size from simply gorging on junk like this. Alana will have a heart attack at 15 at this rate. How irresponsible. Just like malnourishment is considered neglect, so should this level of obesity in a child this age. All of these kids are huge and gross except Anna, the one that wasn’t raised by June. Of course she doesn’t care. All she cares about is that peen. Her daughter for molested by a boyfriend and she dated him again after sugar bear left. She doesn’t care one bit about her children and their wellbeing. Very Sad. I remember when they were on The Doctors. The show was willing to provide a lot of help and resources for them. 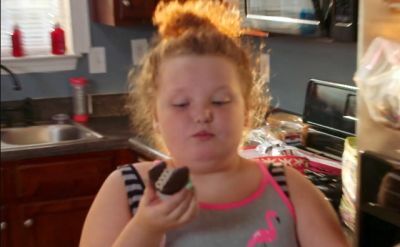 You would think that June would have more control over Alana and her eating habits that have already been established. I remember this and am glad that it was mentioned in the article. From what was shown Alana seemed to like the food alternatives they made. I can see why she wouldn’t want to work out or do physical exercise since she has never been made to. They need to sign her up for some kind of physical activity and make her do it.